"First, he should never show fear." "Second, he should be courteous to all, and always give special attention to the weakest member in the party." "Third, he should be witty, and able to make up a white lie if necessary, on short notice, and tell it in a convincing manner." "Fourth, he should know when and how to show authority...and should be able to give a good scolding to whomsoever deserves it." High Ice Ak courses are ideal for those who want a top quality climbing experience. 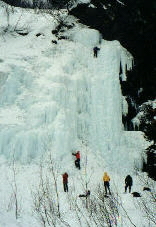 Ice Climbing is on the extreme side of the climbing gamut and requires skill, judgment and intense concentration to do safely. High Ice Ak is not a jack-of-all-trades and master-of-none guide service, claiming to be avid ice climbers while spending majority of our time on rock. High Ice Ak knows how to climb ice; it's our specialty and all we offer. Our courses will safely shorten the ice climbing learning curve and make your on-ice experience a true adventure. All courses are tailored to suit your requirements and are conducted on a personal scale, which gives a lot of flexibility in meeting "your� goals. Operating on a 1:1 or 2:1 student to guide ratio allows "you" to benefit, not a dozen other climbers. High Ice Ak's overriding philosophy is safety-first using teamwork instruction for "your" success. Many trips have lead to climbing friendships for a lifetime. High Ice Ak knows how to climb ice; it is in the name! Come and learn the ice ballet and begin dancing your way up beautiful blue. 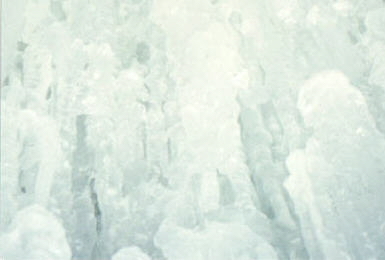 John Bradford began climbing in the fall of 1984 and soon realized ice climbing was his forte. Seeking to ever learn more, he spent countless hours on-ice defining his skills while understanding common made mistakes. Out climbing, he witnessed his same mistakes being made by other climbers. His desire to help others learn from his mistakes and shorten their learning curve led him into guiding in 1991. John is considered one of Alaska�s best technical climbers and is known throughout Alaska for his skills as a professional mountain guide. Seasoned by years of ice climbing experience has earned him the reputation of master ice warrior. A teacher as well as a leader, he is a great mountain companion and believes in providing a challenging and rewarding experience. John�s love for climbing is infectious and he will be honored to be your personal guide and pass his wealth of knowledge on to �you�.